Save $1,000 per couple off round-trip airfare from select gateways, plus save $1,000 per couple off the cruise. Expires April 30. Click here for eligible departures. After breakfast, disembark and proceed to the airport for your return flight. * Perhaps see more of Belgium on a two-night city stay to the capital, Brussels. Or enjoy a three-night extension in the fairy-tale medieval city of Bruges with visits to Ghent, Bruges and Flanders Fields. Set sail on our 10-day itinerary through the inland waterways of The Low Countries—Holland and Belgium. 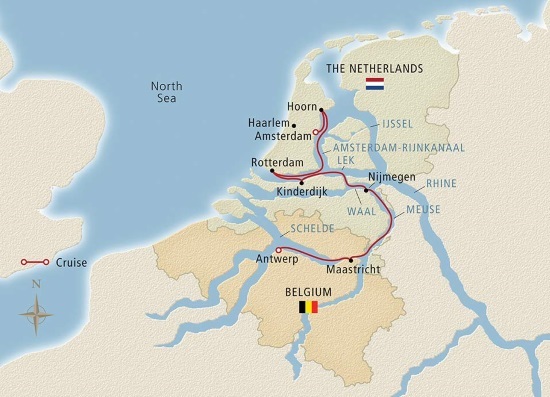 Enjoy scenic cruising through the vast network of canals and rivers, with stops in key cities that allow you to soak up Dutch and Flemish culture and immerse yourself in their history. Cycle through tulip fields or stroll the renowned Keukenhof Gardens. See the windmills of Kinderdijk, a UNESCO World Heritage Site, and fascinating Rotterdam, one of Europe’s most dynamic cities. Finish your cruise with an overnight stay in Europe’s diamond capital, Antwerp. Start your journey in Amsterdam, where you will be centrally located near key sites like Museum Square and the Anne Frank House. Bruges is one of Europe’s most remarkably preserved medieval cities. Its early textile trade made it one of the wealthiest trading towns in the world, and the world’s most important port. You can explore its cobblestone streets, ascend its towering belfry in the Market Square for sweeping views of restored guild houses and tree-shaded squares, and shop for lace and chocolate. Neighboring Ghent has its own treasures, most notably the altarpiece by the brothers van Eyck in St. Bavo’s cathedral, and to the south are Flanders Fields, where some of the fiercest battles of World War I were fought. Explore Brussels, the vibrant capital of Belgium and home to NATO and most of the European Union’s institutions. Enjoy a drink in its lively café scene, then discover multicultural roots and hidden architecture gems of this important river city. * Airport meet & greet transfers included when air is purchased from Viking River Cruises.